ORONO, Maine-- The Maine men's ice hockey team upset the No. 11/12 Providence Friars 3-1 on Saturday night at Alfond Arena. First Goal (1-0 Maine): Chase Pearson scored his 15th of the season after chucking up a puck sent around the boards from the nearside point. Pulling away from the boards, Pearson passed over to Brady Keeper in the high slot. Keeper came down, firing a short pass over to Pearson in stride for a rising wrist shot in. Second Goal (1-1 Providence): On the power play, Spenser Young sent a pass from the point down along the boards to Jason O'Neill at the outside hashmarks. O'Neill passed the puck onto Brandon Duhaime's stick at the top of the crease for the deflected shot to tie the game. Third Goal (2-1 Maine): The Black Bears took the lead in the final minute of the second period shorthanded. Brendan Robbins stole the puck off of a Friars' pass, skating in with room away from the pressuring defenseman to send it five hole on Hawkey. Fourth Goal (3-1 Maine): Winning the puck along the boards, Robbins took the puck away from the Friars player at the blueline, streaking with Mitchell Fossier towards the empty Providence net. Robbins passed over to Fossier for the empty net goal to finish it. - Jeremy Swayman, the game's first star, made 30 saves in the contest. 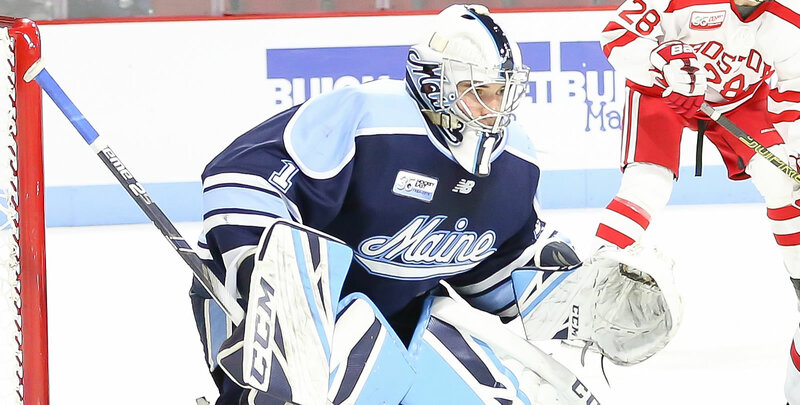 Maine put 33 shots on goal against PC's Hayden Hawkey. - Maine's penalty kill went 2-for-3, plus a shorthanded goal. The Black Bears' first goal of the game came on the man advantage. - The Black Bears defense blocked 12 shots, with Rob Michel leading the squad with three blocks. The Black Bears next travel to North Andover, Mass to take on the Merrimack Warriors on Feb. 15 and 16 at Lawler Rink. Puck drop for both games is 7 p.m.